Click HERE to see my Travel Moleskine, so far. I thought I'd condense this travel themed Moleskine down to one post, so that it's not dominating the main page of my blog. Instead of cutting it down, however, I've just ended up doing a big huge Moley post. But, what's wrong with a bit of Moleskine love between consenting adults, eh? The most frequently asked question from visitors to my blog, who are not part of the drawing community, is what is a Moleskine? Well, Moleskines are sketchbooks. Great ones! I think the mark of a really great product is when you don't have to advertise, your customers do the advertising for you. 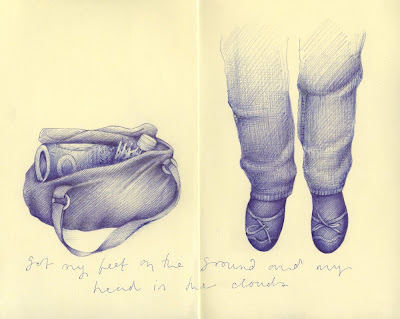 HERE is a link to my first ever Moleskine post, from my first ever Moleskine. I was smitten straight away. HERE you can see the beginnings of my Ballpoint Moleskine. It's a bit rubbish, so far, but it's just the start. And, HERE you'll find the drawings from my Spare Moleskine. A kind of back up Moley. It's the substitute I call off the bench when the others are worn out from too much cross hatching. 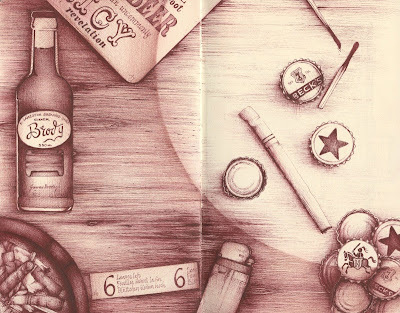 Finally, you'll see the entire set of drawings from my Sepia Moleskine HERE. It's the only one, to date, that I've finished. But mostly, I'm the most excited about my New Moley. Which'll be coming to your screen some time soon. And, if you are not convinced about how great the Moleskine is yet, check out Moleskinerie for all things Moley. Your art is like crack, I love it. I marvel how you leave so much empty space and use the doublepage spreads in a very zen way. I have trouble doing that, I have a synapse that says 'fill all the space raargh!'. My purpose on this earth is to find a way to be as creative as you, as consistent as you and develop that same fabulous ability! Without copying! Your work is wonderful! Have I told you that already? When they ask me what book I want on my desert island I'll say:"Andrea Joseph's Moleskine Omnibus." Andrea: Those rocks...rock! Love those guys. I would love to watch a video of how you progressively add such depth. Let me know if you decide to do a youtube, I'm there! You work is really charmful! Amazing empathy for detail and everyday life's actions. Great Stuff to come across and fall in love right away! 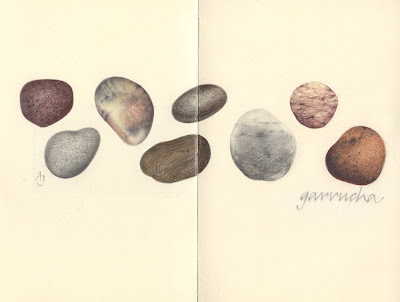 Lovely pebbles, beautifully placed across the pages. Been sat on a beach drawing pebbles, each one is unique. You could, if you wanted, spent the rest of your life just drawing them! They are fascinating. You drew rocks!! How awesome. I agree with Dave Terry - if you ever post a you tube video of yourself as you're drawing, I would LOVE to watch it. I must be the millionth person to say it but, you work is awe inspiring. your attention to detail is amazing! I'm in love with it. Wow!!! It's been a long time, I know. In honor of my birthday tomorrow and blog anniversary in June. Please, stop by, say hi! I love those stones! And the camera ... well, just too good, really. I've just acquired an SLR and wouldn't know where to begin in putting it onto paper. I find myself in awe... I am new to your blog, but you demonstrate some truly remarkable skills with the ball point pen which will keep me coming back. Oooh...you take drawing to whole new level! 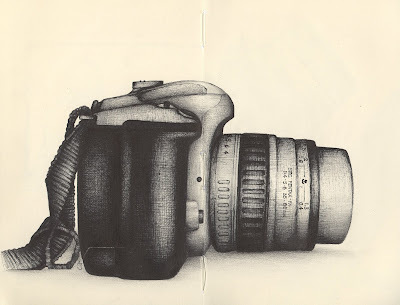 I love these drawings. And your watercolor keys and stones are simply lovely. Thanks for commenting today...I appreciate your opinion. Sorry for being a bit negletful (is that a word??) recently. I'm back now, and raring to go.